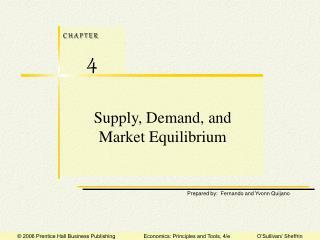 Supply, Demand, and Market Equilibrium. Perfectly Competitive Market. 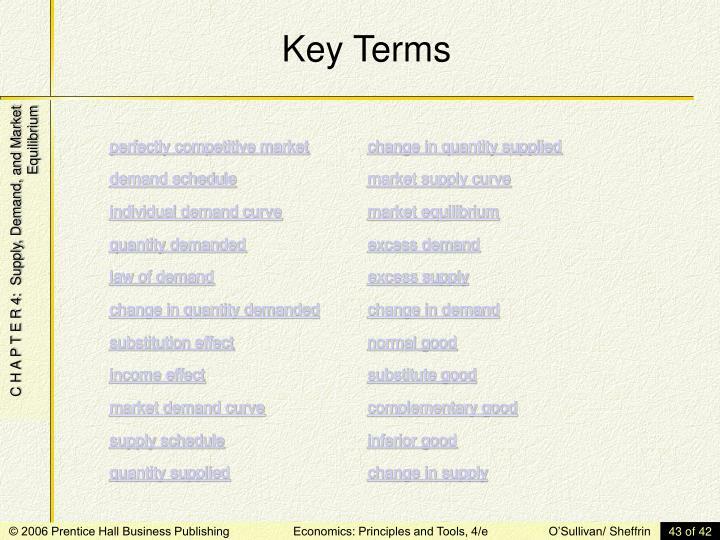 supply and demand—the most important tool of economic analysis—the simplest! 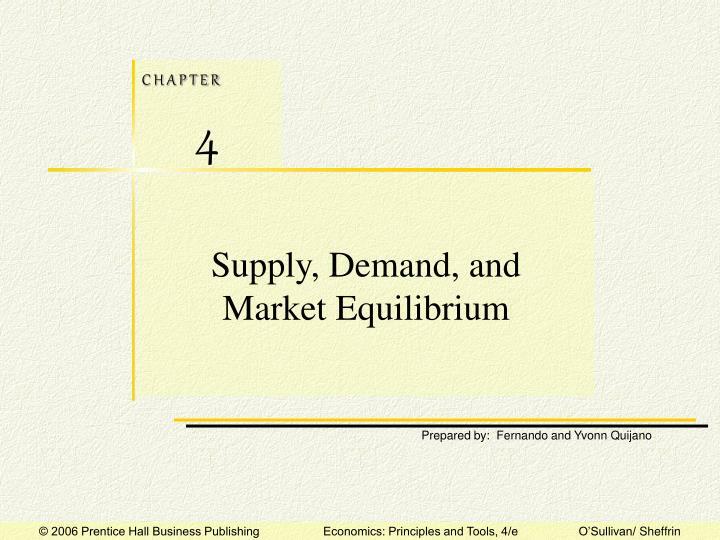 The model of supply and demand explains how a perfectly competitive market operates. supply and demand—the most important tool of economic analysis—the simplest! 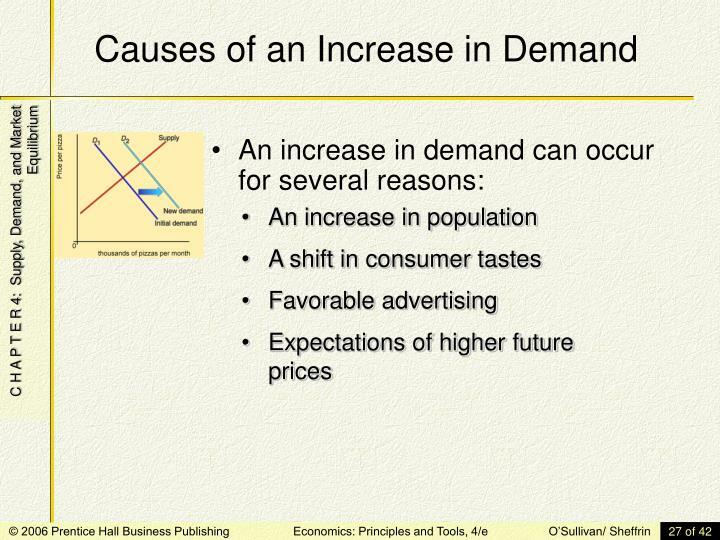 The model of supply and demand explains how a perfectly competitive market operates. 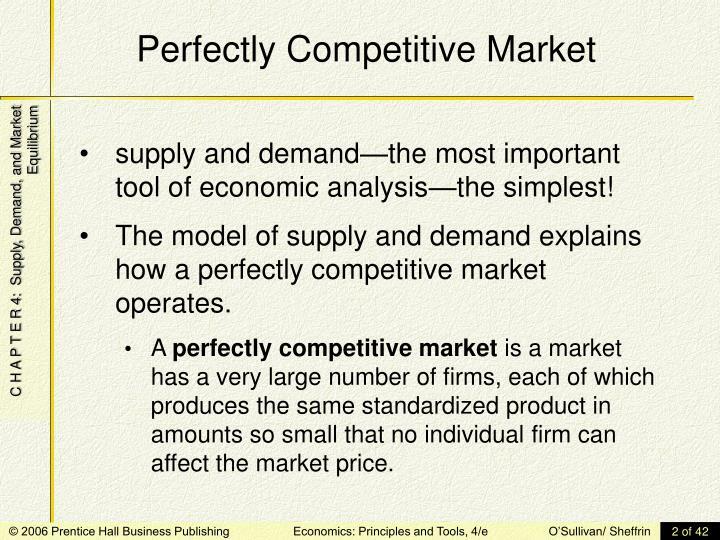 A perfectly competitive market is a market has a very large number of firms, each of which produces the same standardized product in amounts so small that no individual firm can affect the market price. 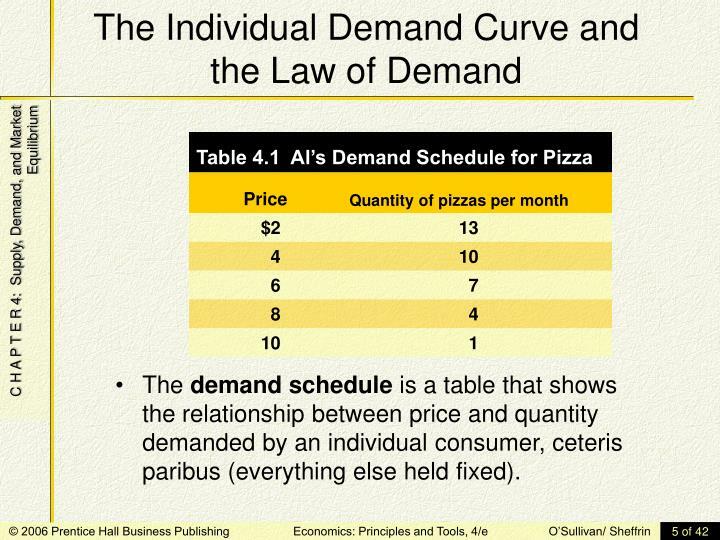 The demand schedule is a table that shows the relationship between price and quantity demanded by an individual consumer, ceteris paribus (everything else held fixed). 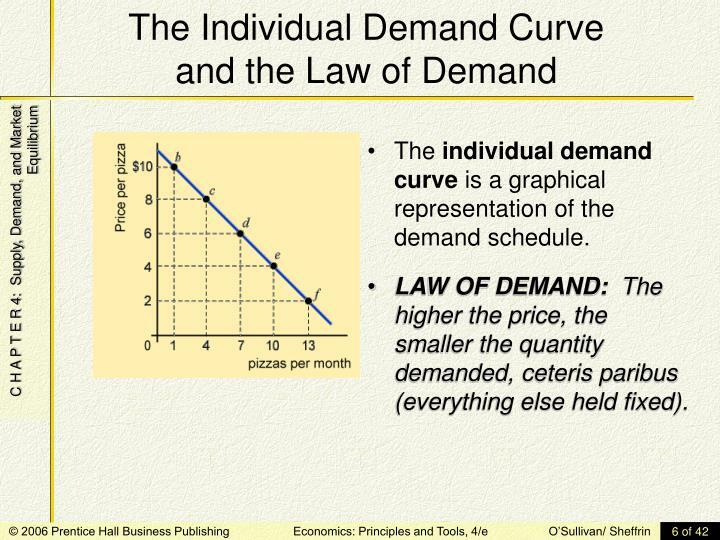 The individual demand curve is a graphical representation of the demand schedule. 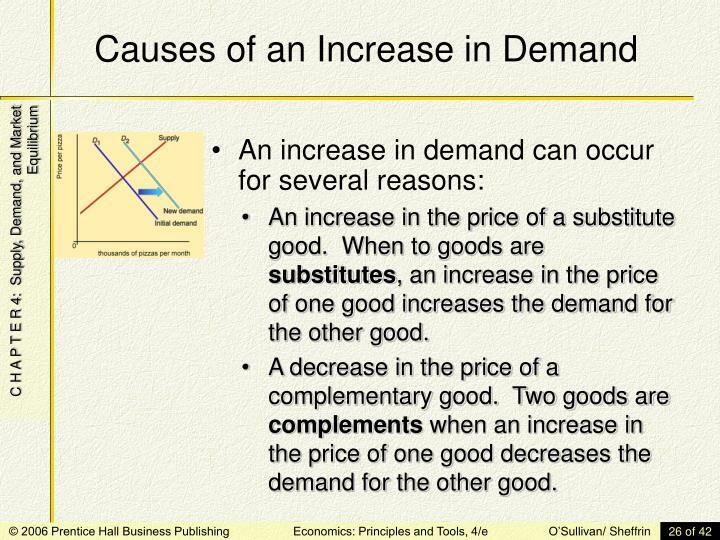 LAW OF DEMAND: The higher the price, the smaller the quantity demanded, ceteris paribus (everything else held fixed). 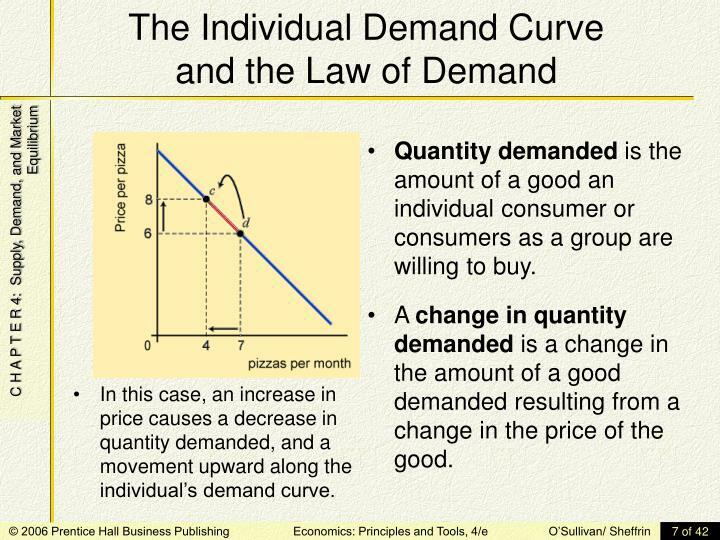 Quantity demanded is the amount of a good an individual consumer or consumers as a group are willing to buy. 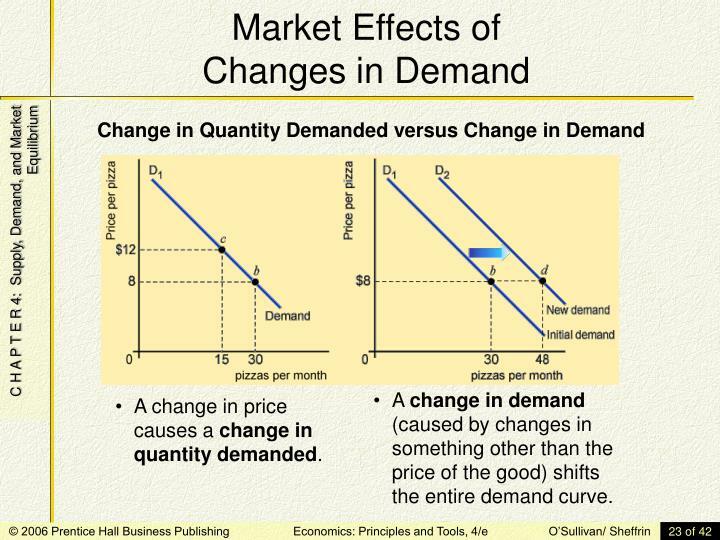 A change in quantity demanded is a change in the amount of a good demanded resulting from a change in the price of the good. 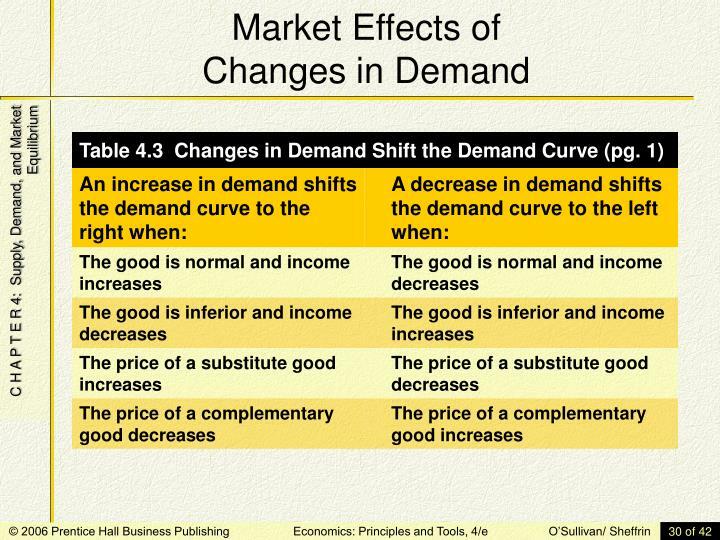 In this case, an increase in price causes a decrease in quantity demanded, and a movement upward along the individual’s demand curve. 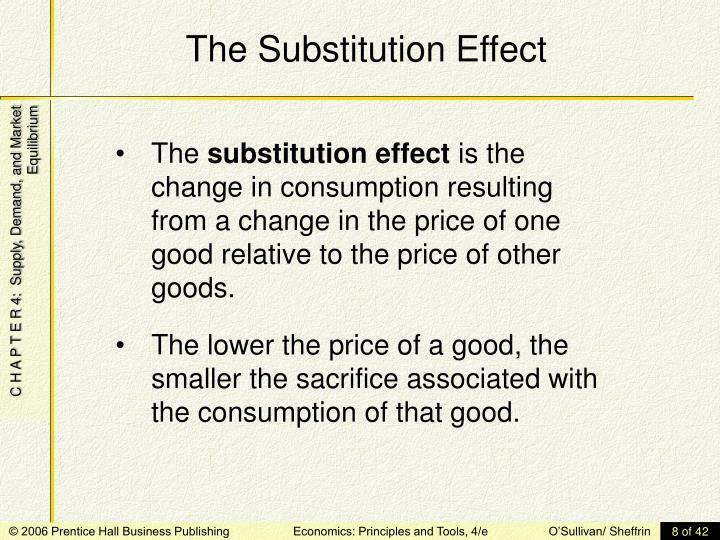 The substitution effect is the change in consumption resulting from a change in the price of one good relative to the price of other goods. The lower the price of a good, the smaller the sacrifice associated with the consumption of that good. 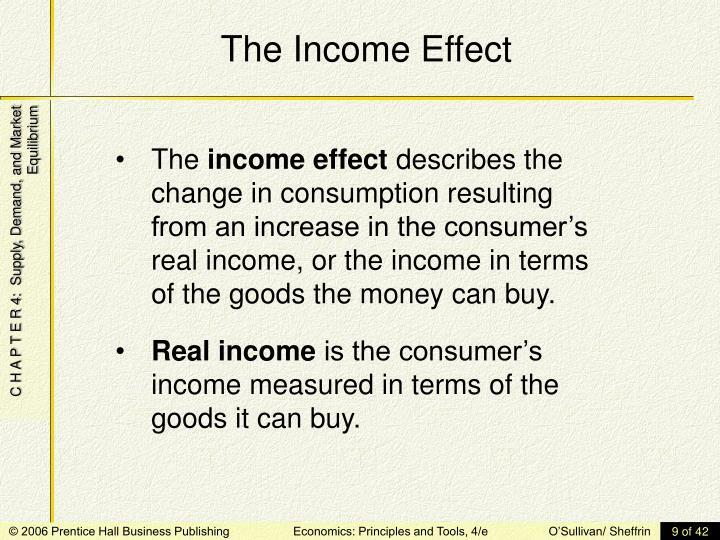 The income effect describes the change in consumption resulting from an increase in the consumer’s real income, or the income in terms of the goods the money can buy. Real income is the consumer’s income measured in terms of the goods it can buy. 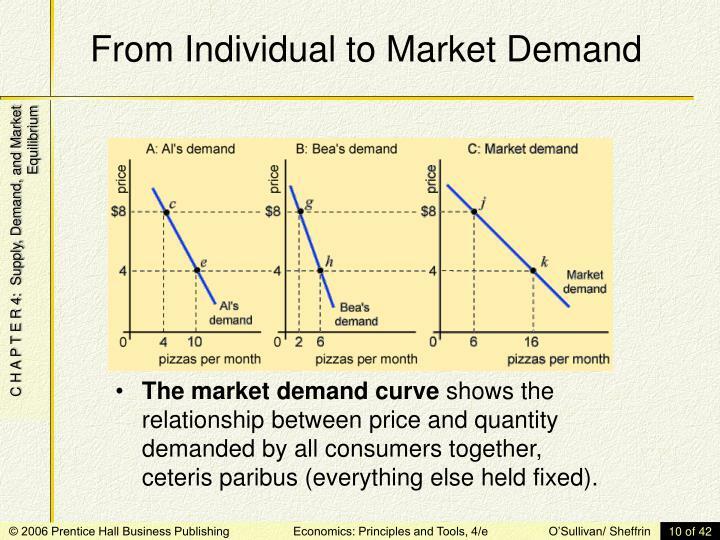 The market demand curve shows the relationship between price and quantity demanded by all consumers together, ceteris paribus (everything else held fixed). The price of the product—in this case, the price of pizza. The cost of the inputs used to produce the product, for example, wages paid to workers, the cost of dough and cheese, and the cost of the pizza oven. The state of production technology, such as the knowledge used in making pizza. The number of producers—in this case, the number of pizzerias. Producer expectations about the future price of pizza. Taxes paid to the government or subsidies received from the government. 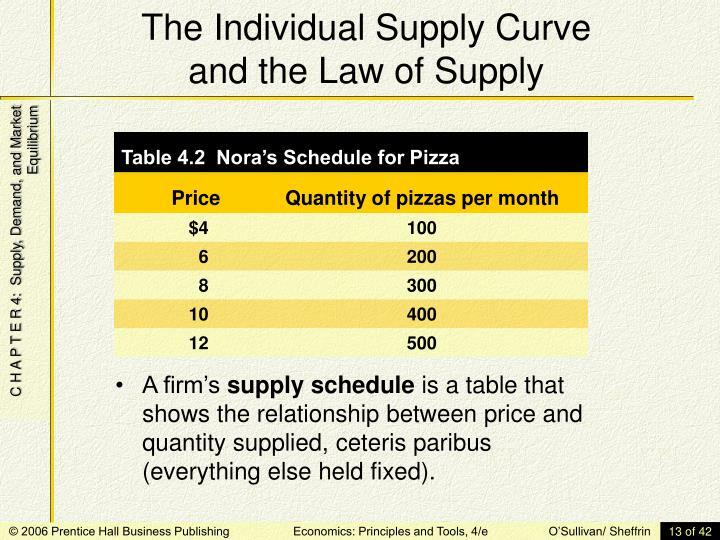 A firm’s supply schedule is a table that shows the relationship between price and quantity supplied, ceteris paribus (everything else held fixed). 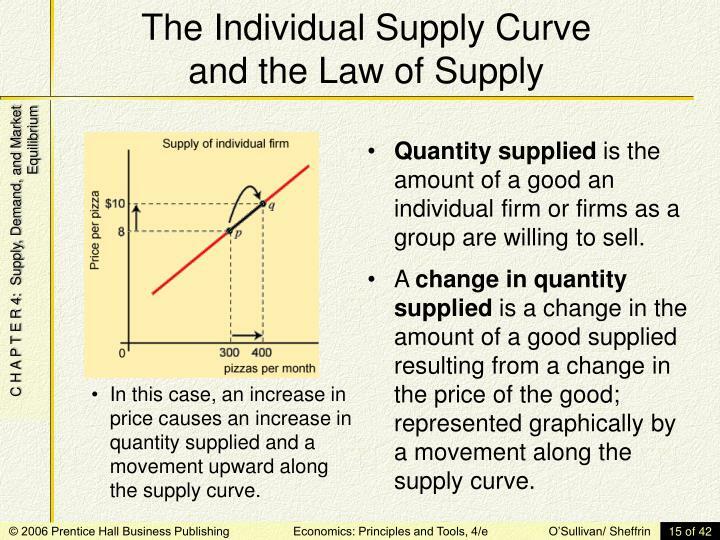 The individual supply curve is a graphical representation of the supply schedule. 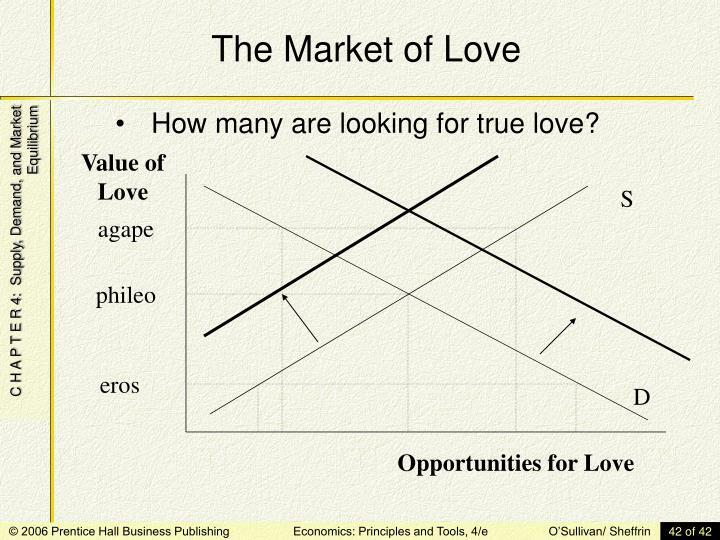 Its positive slope reflects the law of supply. 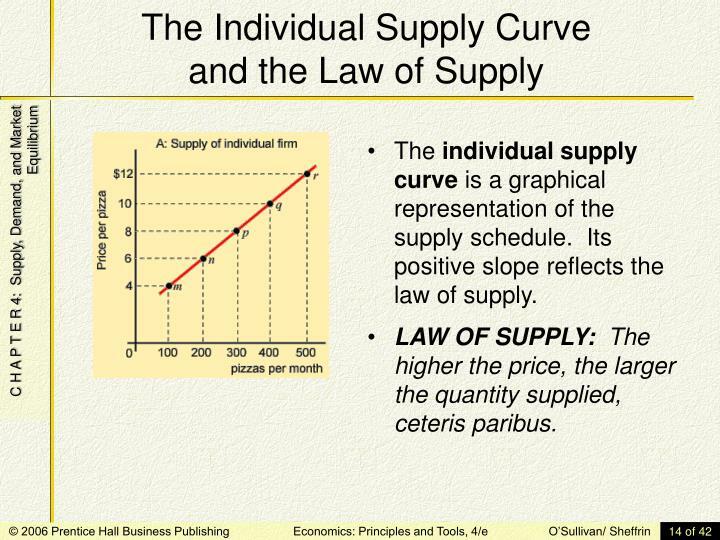 LAW OF SUPPLY: The higher the price, the larger the quantity supplied, ceteris paribus. Quantity supplied is the amount of a good an individual firm or firms as a group are willing to sell. 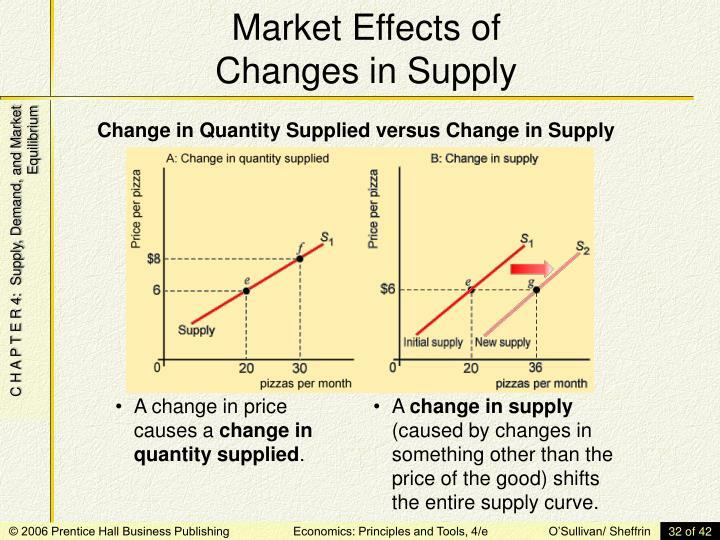 A change in quantity supplied is a change in the amount of a good supplied resulting from a change in the price of the good; represented graphically by a movement along the supply curve. 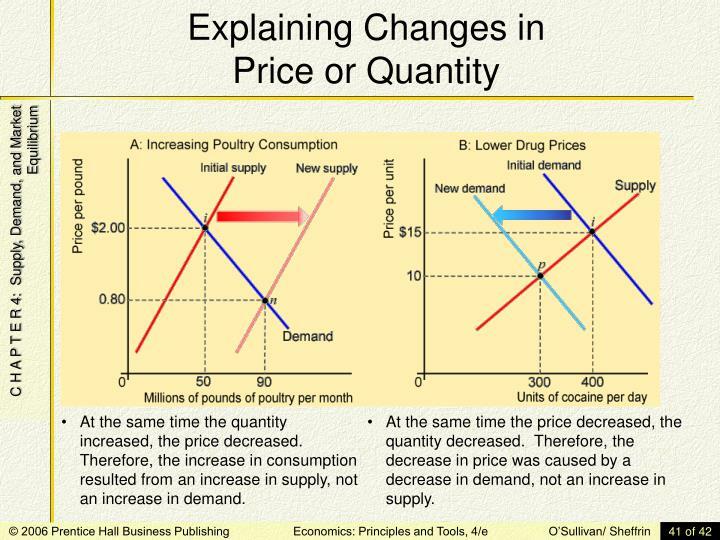 In this case, an increase in price causes an increase in quantity supplied and a movement upward along the supply curve. 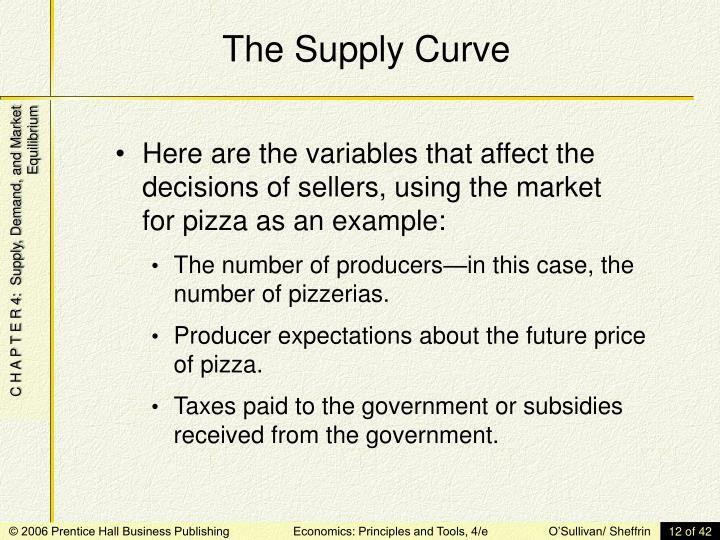 Why is the Individual SupplyCurve Positively Sloped? To determine how much to produce, the individual firm chooses the quantity of output that satisfies the marginal principle. 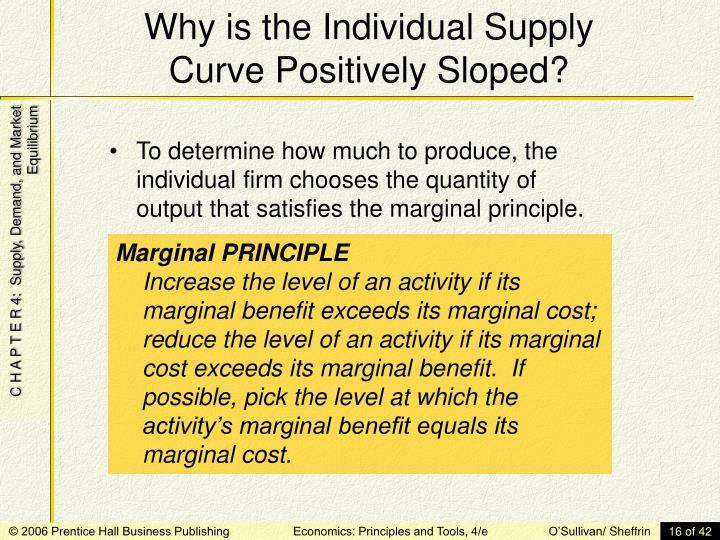 Marginal PRINCIPLEIncrease the level of an activity if its marginal benefit exceeds its marginal cost; reduce the level of an activity if its marginal cost exceeds its marginal benefit. If possible, pick the level at which the activity’s marginal benefit equals its marginal cost. 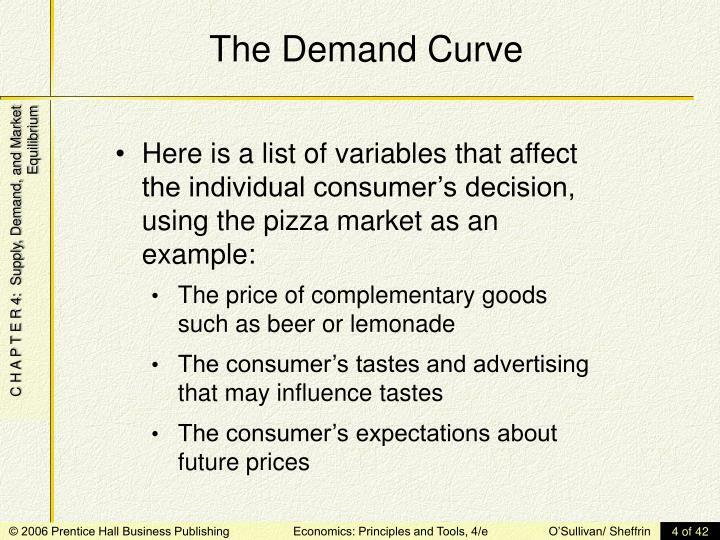 The marginal benefit of selling a pizza is the price received when the pizza is sold. 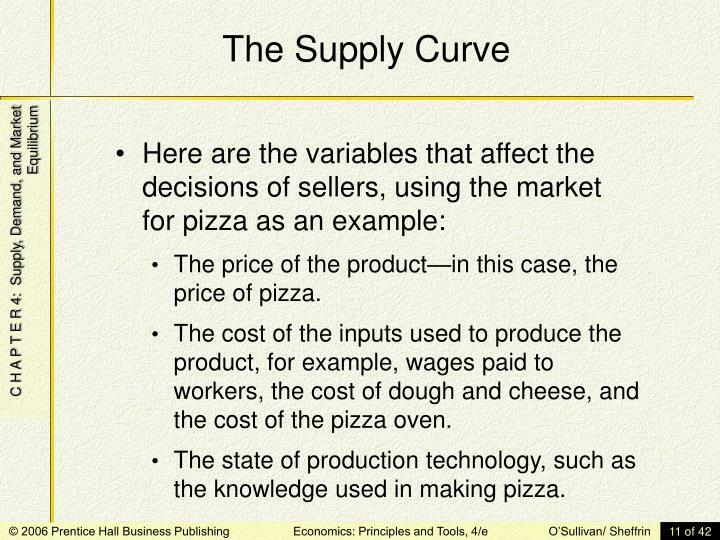 Marginal cost is the cost of producing an additional pizza. 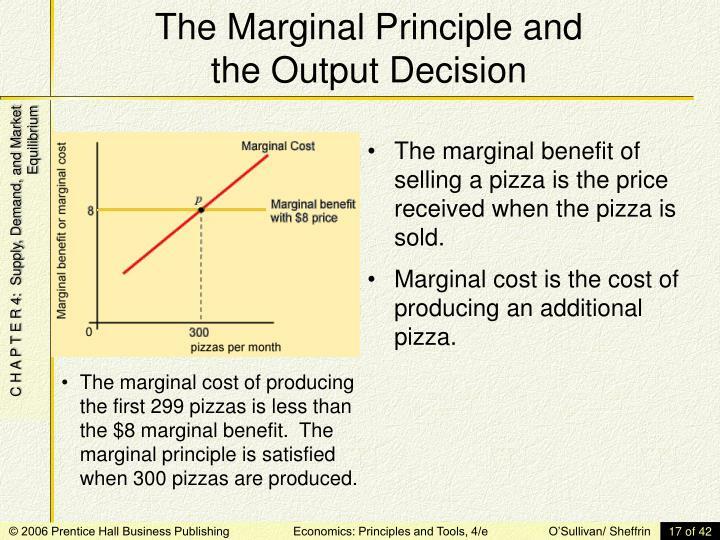 The marginal cost of producing the first 299 pizzas is less than the $8 marginal benefit. The marginal principle is satisfied when 300 pizzas are produced. 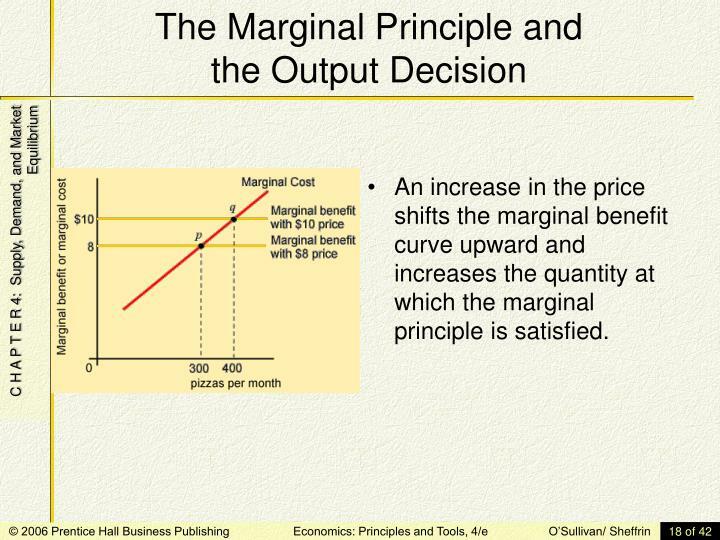 An increase in the price shifts the marginal benefit curve upward and increases the quantity at which the marginal principle is satisfied. The market supply curve shows the relationship between price and quantity supplied by all producers together, ceteris paribus (everything else held fixed). 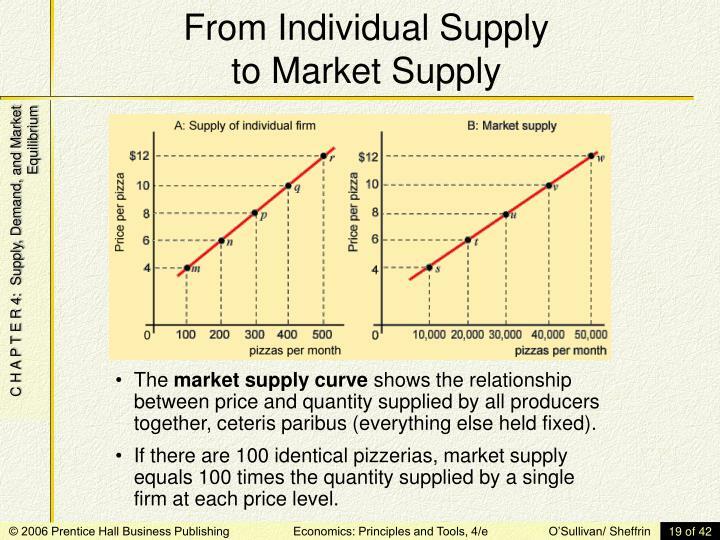 If there are 100 identical pizzerias, market supply equals 100 times the quantity supplied by a single firm at each price level. 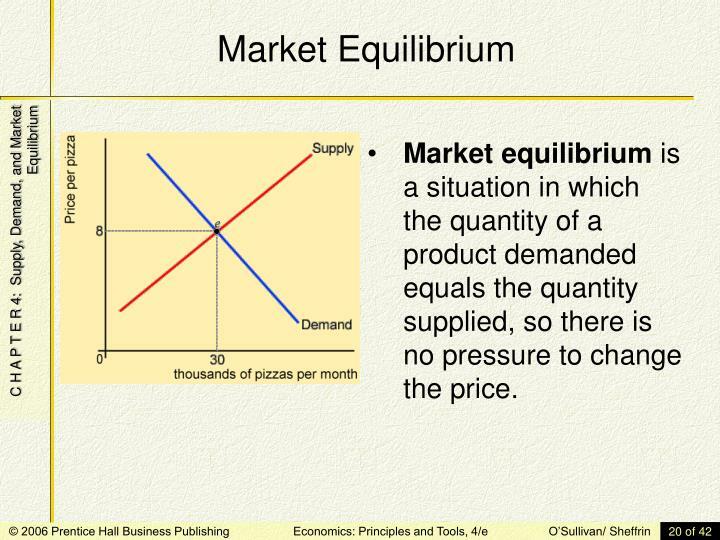 Market equilibrium is a situation in which the quantity of a product demanded equals the quantity supplied, so there is no pressure to change the price. 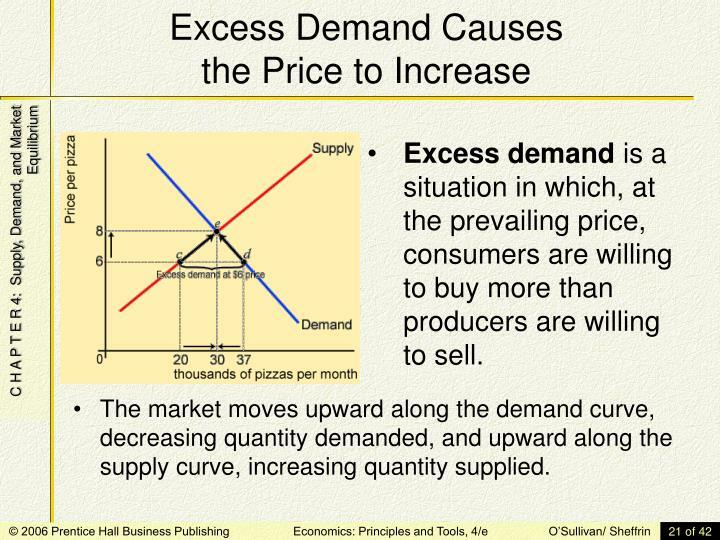 Excess demand is a situation in which, at the prevailing price, consumers are willing to buy more than producers are willing to sell. The market moves upward along the demand curve, decreasing quantity demanded, and upward along the supply curve, increasing quantity supplied. 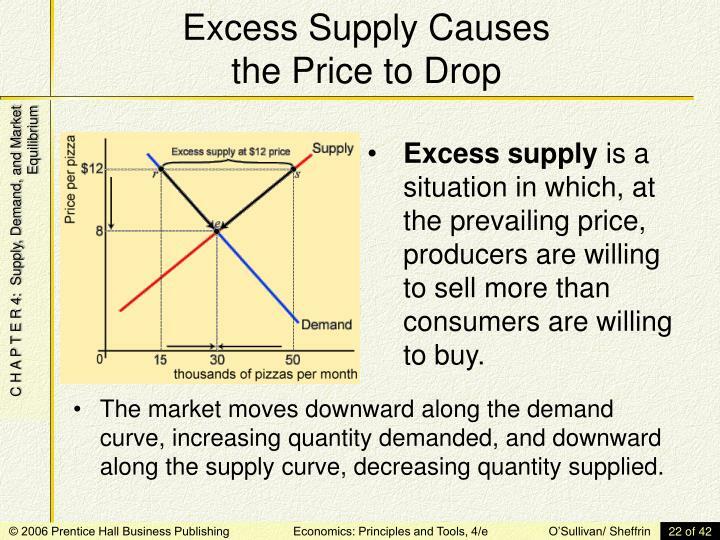 Excess supply is a situation in which, at the prevailing price, producers are willing to sell more than consumers are willing to buy. The market moves downward along the demand curve, increasing quantity demanded, and downward along the supply curve, decreasing quantity supplied. A change in price causes a change in quantity demanded. 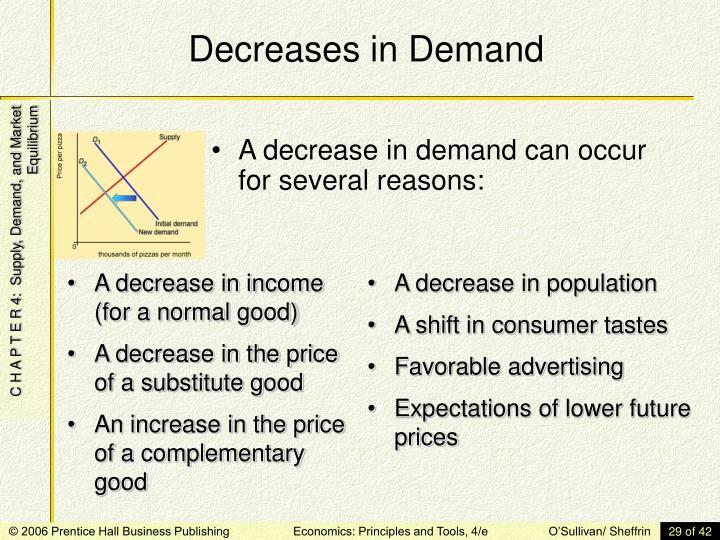 A change in demand (caused by changes in something other than the price of the good) shifts the entire demand curve. 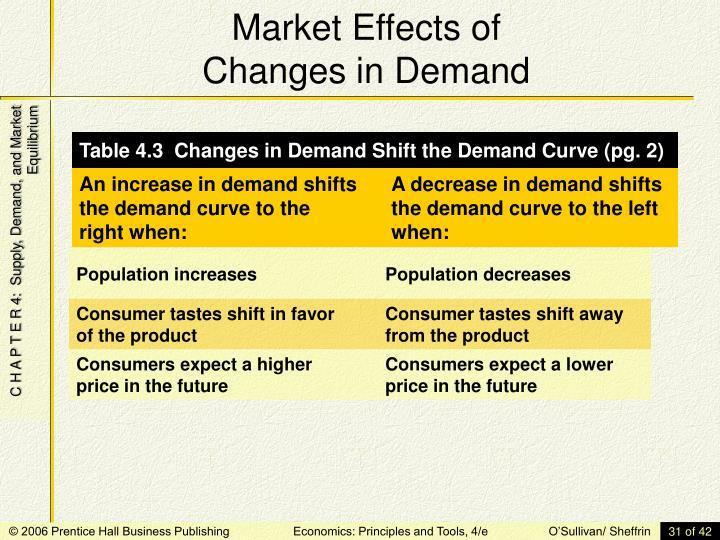 An increase in demand shifts the market demand curve to the right. At the initial price of $8, there is now excess quantity demanded. 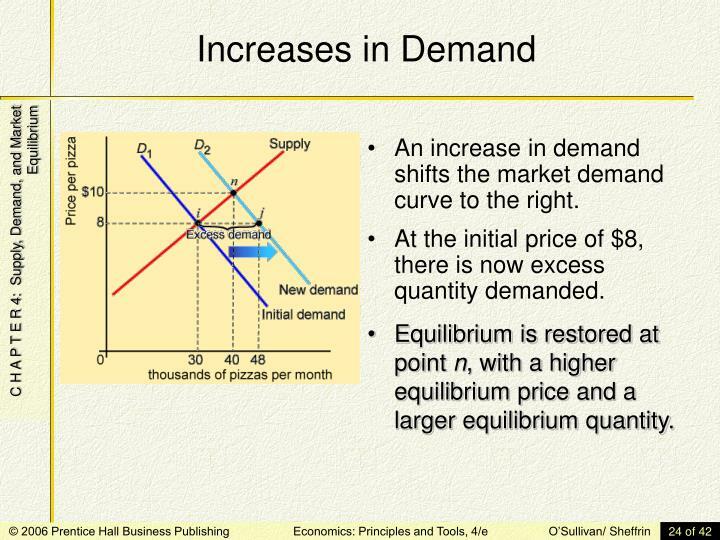 Equilibrium is restored at point n, with a higher equilibrium price and a larger equilibrium quantity. An increase in income (for a normal good). A normal good is a good that consumers buy more of when their income increases. Most goods fall in this category. A decrease in income (for an inferior good). An inferior good is the opposite of a normal good. 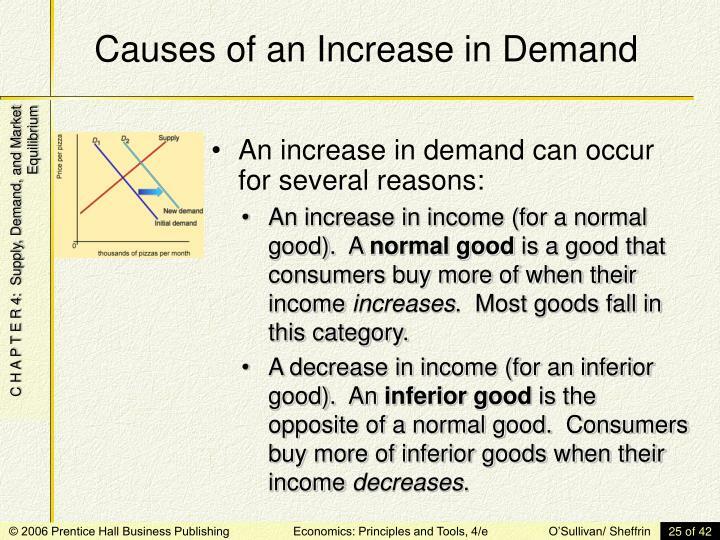 Consumers buy more of inferior goods when their income decreases. An increase in the price of a substitute good. When to goods are substitutes, an increase in the price of one good increases the demand for the other good. A decrease in the price of a complementary good. Two goods are complements when an increase in the price of one good decreases the demand for the other good. 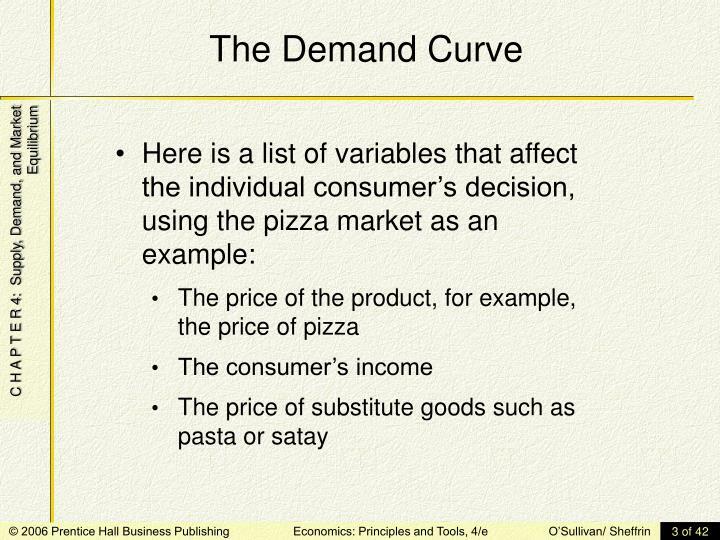 A decrease in demand shifts the demand curve to the left. At the initial price of $8, there is now an excess supply. 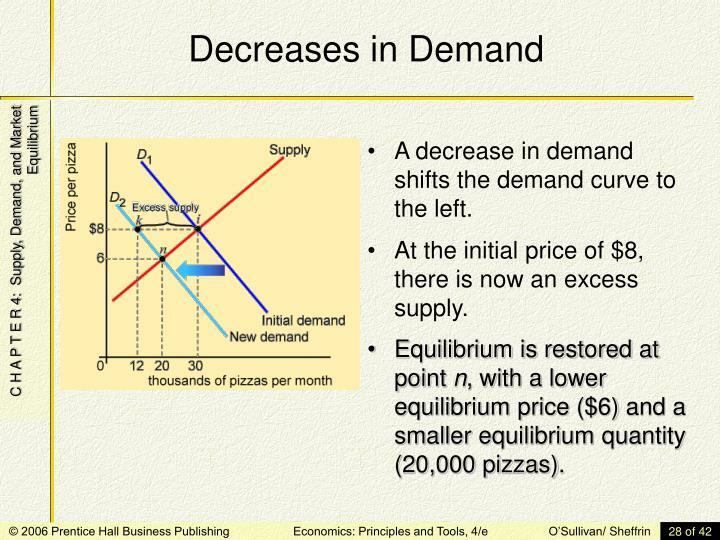 Equilibrium is restored at point n, with a lower equilibrium price ($6) and a smaller equilibrium quantity (20,000 pizzas). A change in price causes a change in quantity supplied. 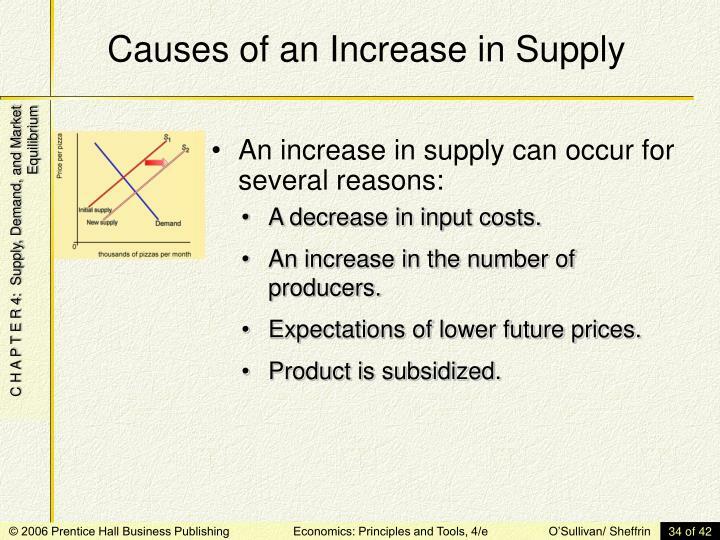 A change in supply (caused by changes in something other than the price of the good) shifts the entire supply curve. 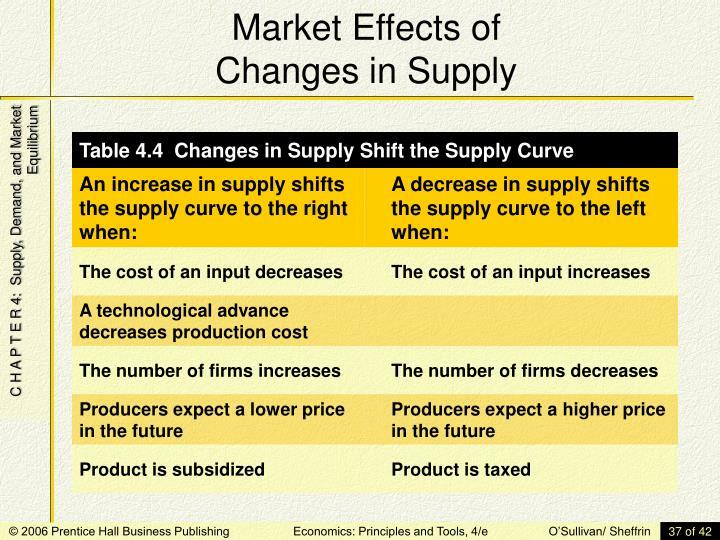 An increase in supply shifts the market supply curve to the right. At the initial price of $8, there is now excess supply. Equilibrium is restored at point n, with a lower equilibrium price and a larger equilibrium quantity. A decrease in input costs. An increase in the number of producers. Expectations of lower future prices. 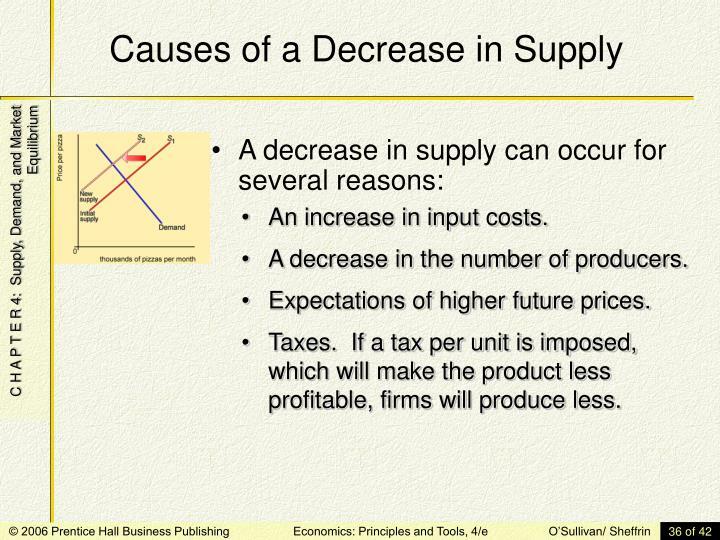 A decrease in supply shifts the supply curve to the left. At the initial price of $8, there is now an excess demand. 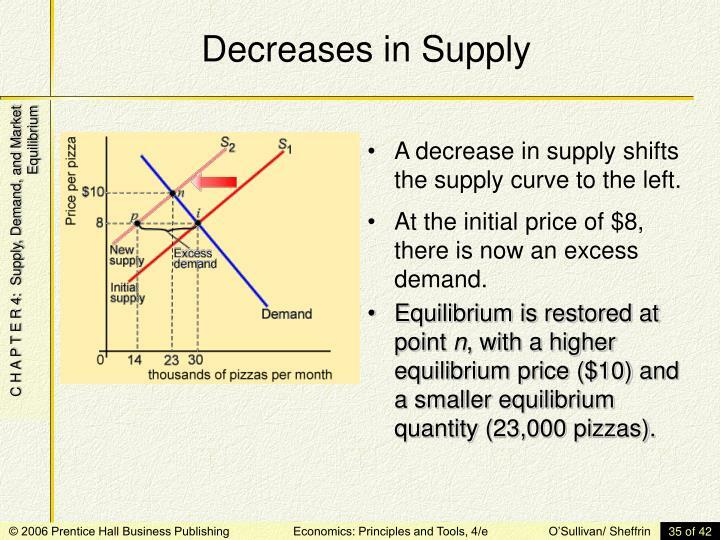 Equilibrium is restored at point n, with a higher equilibrium price ($10) and a smaller equilibrium quantity (23,000 pizzas). An increase in input costs. A decrease in the number of producers. Expectations of higher future prices. Taxes. If a tax per unit is imposed, which will make the product less profitable, firms will produce less. 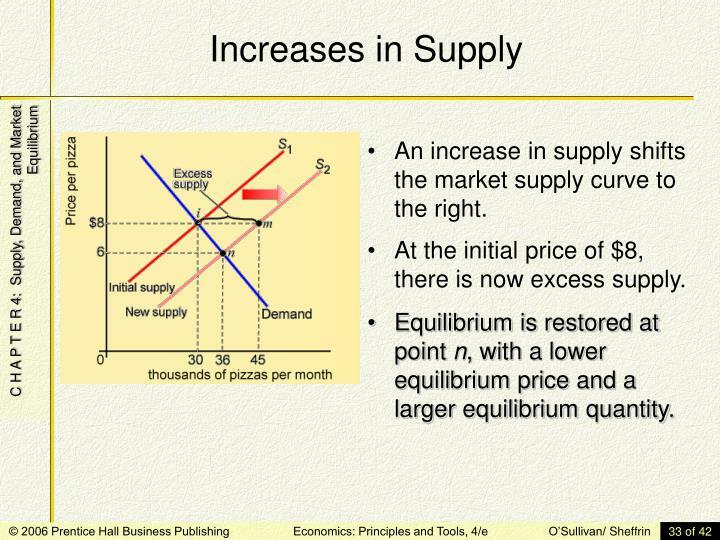 The equilibrium price will decrease and the equilibrium quantity will increase. Both the equilibrium price and the equilibrium quantity will increase. 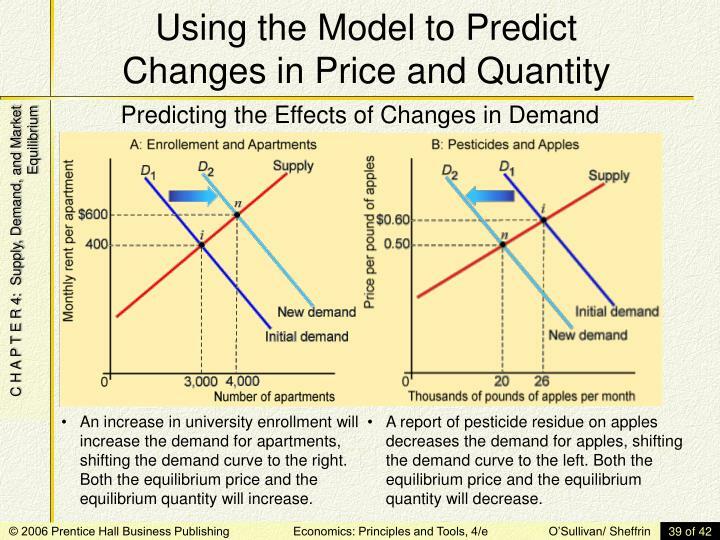 An increase in university enrollment will increase the demand for apartments, shifting the demand curve to the right. Both the equilibrium price and the equilibrium quantity will increase. A report of pesticide residue on apples decreases the demand for apples, shifting the demand curve to the left. Both the equilibrium price and the equilibrium quantity will decrease. Technological innovation decreases production costs, shifting the supply curve to the right. The equilibrium price decreases, and the equilibrium quantity increases. 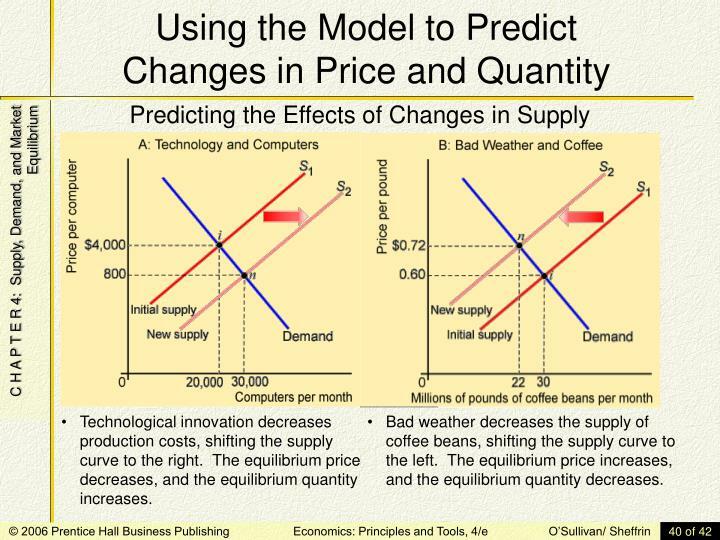 Bad weather decreases the supply of coffee beans, shifting the supply curve to the left. 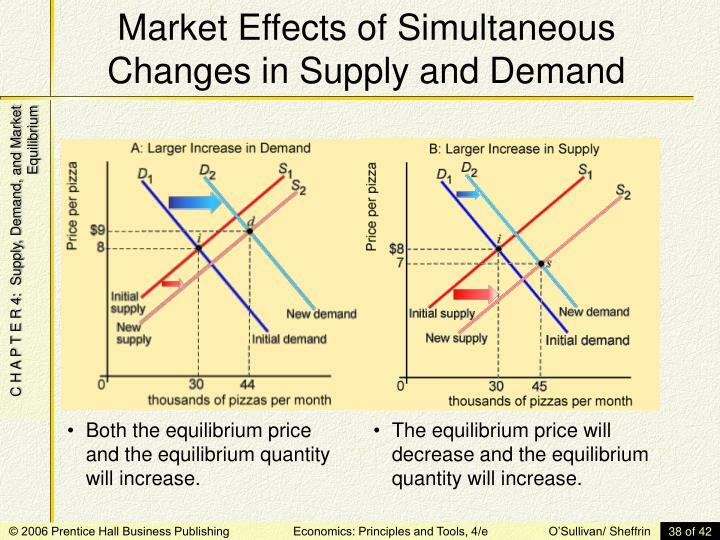 The equilibrium price increases, and the equilibrium quantity decreases. At the same time the quantity increased, the price decreased. Therefore, the increase in consumption resulted from an increase in supply, not an increase in demand. At the same time the price decreased, the quantity decreased. Therefore, the decrease in price was caused by a decrease in demand, not an increase in supply. How many are looking for true love?